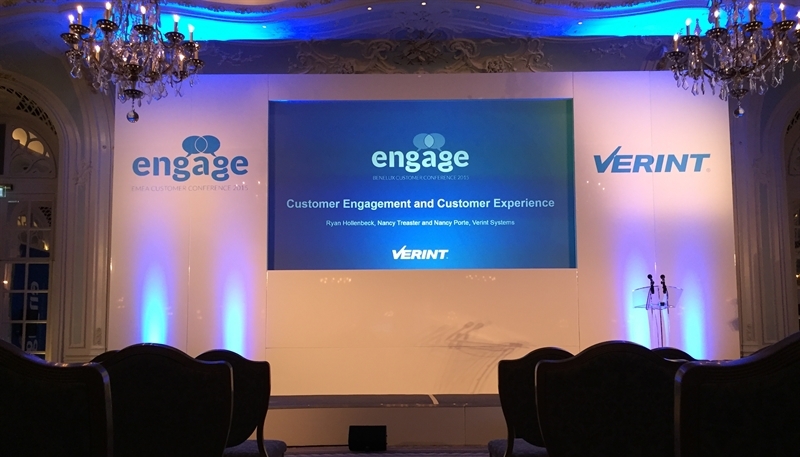 The Engage conference held at the Savoy Hotel, London was part two of Verints European conference tour, first stop was Amsterdam. The evening before the main conference, an awards ceremony was held within one of the suites. 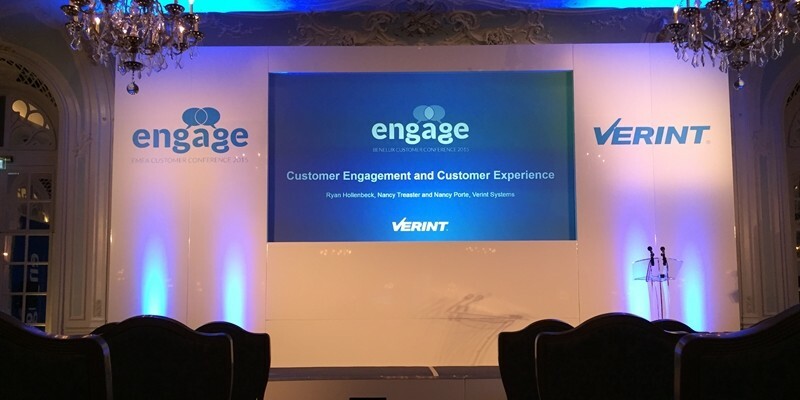 Verint Systems is a leading global provider of Actionable Intelligence® solutions, this was an interactive conference for customers and associates with a focus on customer engagement and loyalty. To design and install the set, stage, furniture and AV design for the awards ceremony and conference. 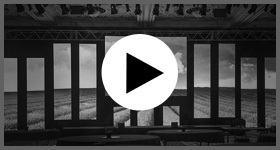 We designed full set, stage integrating the panels manufactured for the Amsterdam conference. LED stage wash & and generic stage wash positioned in the main room. 6k Panasonic Projection screen & 80” relay screens positioned around the space. D&B point source PA system was designed within the space due to short installation times. Plasmas screens were supplied to all sponsors exhibitions booths. We installed the equipment for the conference overnight as the awards ceremony was taking place. The overnight crew handed over to the Show crew that would work on site during the conference. This was a very complex installation due to noise restrictions outside the venue and events running before and after this conference. Time constraints and penalties would have been appointed if we did not complete on time – we therefore had to design a very tight crew schedule to ensure this didn`t happen. “I wanted to thank you and your team again for doing a fantastic job. You made it all very easy for us as we didn’t have any AV related worries. I think that if you were based in the US, my colleagues whom you worked with would want you to do the US conference (1000 guests and four days) – he was very impressed! Following this successful event we have secured a sole supply agreement with Verint, which includes 3 European conferences in 2016.